The Kerry legend announced his shock decision to retire last night. 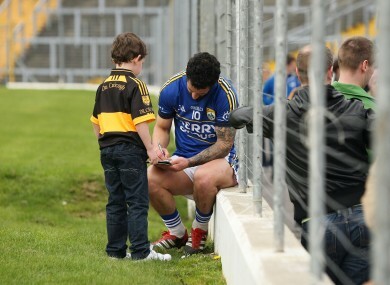 Galvin signs an autograph for one of his young fans, Ryan Neeson. BERNARD BROGAN PAID tribute to “one of the greatest number 10s to play the game” as Kerry legend Paul Galvin retired from inter-county football. Galvin made the shock announcement last night, calling time on a career that was never dull and saw him win four All-Irelands and the 2009 Footballer of the Year award. Email “'One of the greatest number 10s to play the game' - the first of the tributes to Paul Galvin”. Feedback on “'One of the greatest number 10s to play the game' - the first of the tributes to Paul Galvin”.